We'll clear your blocked toilet quickly!! 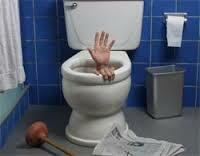 There is nothing in your house that's more urgent than having a blocked toilet unblocked as soon as possible. This is one of the plumbing jobs where we appreciate the urgency of our clients needs and will always arrive on the job as soon as is humanly possible. No Mess & No Fuss ! !